Prior to the 2019 Shot Show, Franklin Armory made a bit of a splash by releasing information about a prototype, magazine fed, pistol that was non Semi-Automatic, but which looked very much like a Semi-Automatic. The pistol in the picture has a pistol arm brace, making it look like a carbine. The firearm was said to utilize a digital action, and to fire one round with each pull of the trigger. Jay Jacobson, President of Franklin Armory, was kind enough to take time and explain how the system works. He used the prototype to show the system operating the bolt and bolt carrier. Jay explained he would not show the internal parts. First, the digital action has everything to do with a flesh and blood digit, not a numerical one. The digit that powers the system is the trigger finger. We already have systems that do this. They are called double action revolvers. There was another system that used finger power to feed from a magazine. It was the Dardick pistol and carbine, an interesting combination of revolver and magazine feed. A few were produced. It was not successful. The Providence digital system is different. It uses a reciprocating bolt and bolt carrier system to feed cartridges from the magazine into the chamber and to extract and eject the fired cartridge cases. 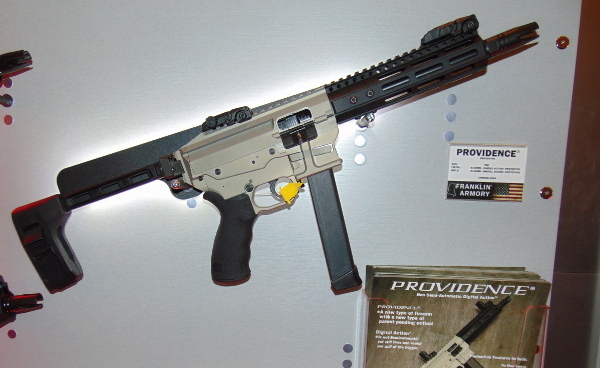 The bolt head of the Providence system is similar to the AR-15 multi-lug system. It locks with a rotating bolt. The bolt rotates about 23 degrees. The firing sequence is this. The firearm starts with an empty chamber or a fired case in the chamber. Pulling the trigger unlocks the bolt, retracts the bolt and bolt carrier, and ejects the fired case, if there is one. The trigger continues to retract the bolt carrier and the bolt, until the trigger releases both. Then the bolt and bolt carrier move forward, stripping a round from the magazine and chambering it. The bolt carrier continues forward, rotating and locking the bolt. There is a fixed firing pin on the bolt carrier. The bolt carrier continues forward. The firing pin on the bolt carrier impacts the primer, firing the chambered round. The fired case stays in the chamber, locked in by the bolt. The sequence begins again with another pull of the trigger. An advantage of the system, firing from a locked bolt, would be to take full advantage of a suppressor. There is no gas leakage to the rear of the fired case. No gas or powder fouling is introduced into the action. 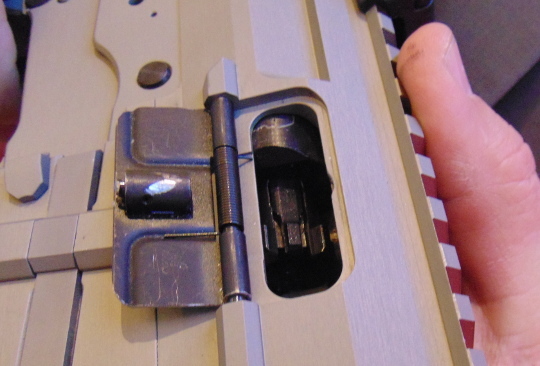 There is a non-reciprocating charging handle on the left side of the firearm. Jay indicated, that in production models, the charging handle might be used to put the firearm into "single action" mode. I presume that would be to retract the bolt and bolt carrier, extracting a fired case. Then the function of the trigger would be to release the bolt and bolt carrier to fire the firearm. Such an action would be a novel version of a straight pull bolt action. Another advantage of this non Semi-Automatic is legal acceptability. Jay told me they are working to have this action classed as a "C" type action in Europe. That would mean it would be available to most people. The magazines would be limited to 10 rounds. The initial calibers would be 9mm, 10mm, and .45. The price has been estimated to be about $1500. No Manufacturer's Suggested Retail Price is available at this time.